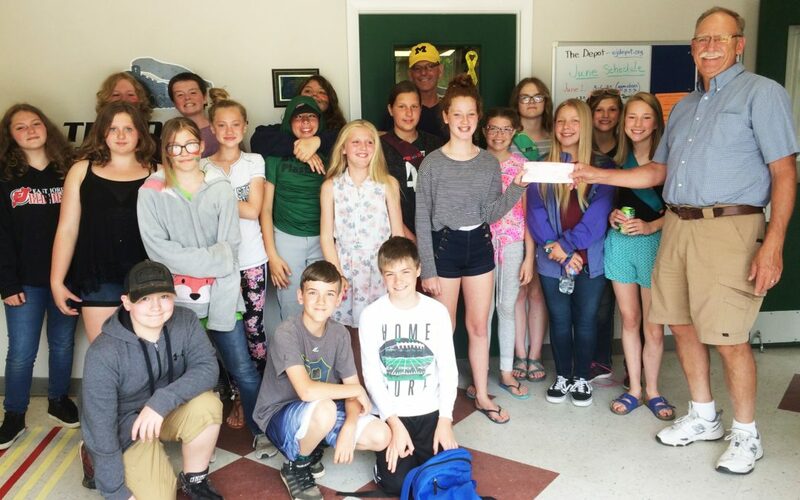 Representatives of the East Jordan class of 2024 class present a check for $1,000 to The Depot, Jordan Valley Teen Center. Each year the sixth-grade class participates in a fundraiser know as Enterprise Day and raise money for charities. This year The Depot was one of two organizations the students voted to support. Pictured are (from left back row) Isabelle Lowe, Kittie Howard, Kayli Rose, Mya Lucero, Paul Keyser, Lila Kelly, Beth Smith, (middle row) Angelina Richey, CK Green, Amelia Wozniak, Angel Delgado, Alicia Ennik, Grace Nemecek, Madison Sheridan, Alyssa Sherman, Katlynn Dunson, Tara Outman, Pete Elliott, (front) Justin McCully, Lane Vincent, and Oliver Imel.